John Carlini is a guitar master. 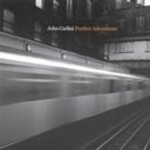 In “Further Adventures,” the first recording to focus exclusively on his exquisite solo guitar work, John sets forth (with Jim Cox – bass and Phil Gratteau – drums)a collection of jazz and contemporary standards. John’s own composition “T for Me” is also included. This all-instrumental, stunningly recorded album of laid back, acoustic jazz would be a fitting addition to the music collection of any acoustic music fan.